`Lord Orford mentioned many particulars relative to the late Mr. Topham Beauclerc [the celebrated wit]. He said He was the worst tempered man He ever knew. Lady Di passed a most miserable life with him. Lord 0, out of regard to her invited them occasionally to pass a few days at Strawberry Hill. They slept in separate beds. Beauclerc was remarkably filthy in his person which generated vermin. He took Laudanum regularly in vast quantities. He seldom rose before one or two o'clock.? 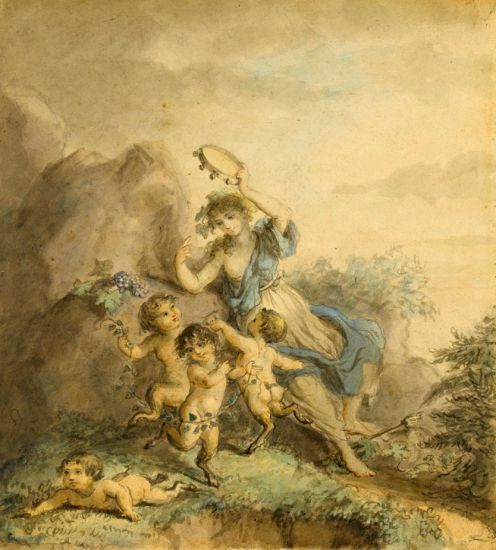 She was well known for her drawings of children and infant cupids and bacchantes, some of which were engraved by Bartolozzi, and she also produced designs for Wedgwood pottery. Walpole was a great admirer of her work and built a room at Strawberry Hill to house her drawings. Examples of her work are in the V and A, the Royal Collection and the British Museum. 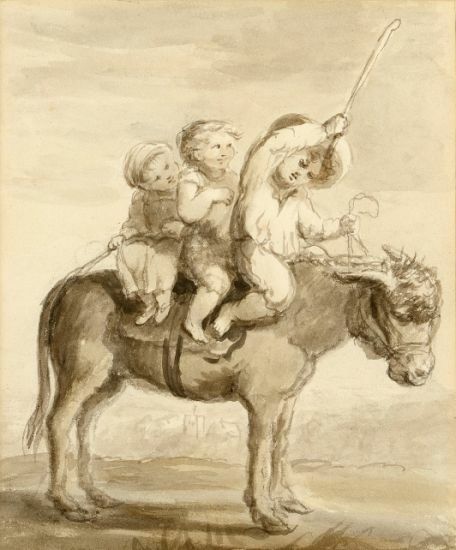 For more on the artist, see B. C. Erskine, Lady Diana Beauclerk: her life and work, 1903. 14.8 x 18.9 cm., 5 ? x 7 ? in. Lady Beauclerk was born Lady Diana Spencer and was the eldest daughter of Charles Spencer, 3rd Duke of Marlborough. She grew up at Blenheim Palace and made copies of the pictures there from a young age. In 1757 she married the 2nd Viscount Bolingbroke but divorced him in 1768 and married Topham Beauclerk (1739-1780) two days later. They moved in court circles and Lady Diana?s closest friends were the Countesses of Pembroke and Spencer and the Duchess of Devonshire. After her husband?s death, she moved into Devonshire Cottage in Richmond. 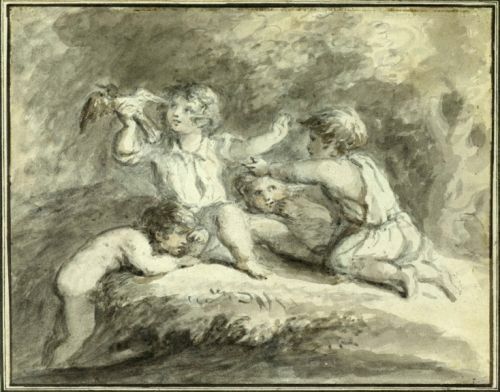 She was well known for her drawings of children and infant cupids and bacchantes, some of which were engraved by Bartolozzi, and she also produced designs for Wedgwood pottery. Horace Walpole was a great admirer of her work and built a room at Strawberry Hill to house her drawings. Examples of her work are in the V. & A., the Royal Collection and the British Museum. For a similar drawing entitled `Cupids with Doves?, see Beatrice Erskine, Lady Diana Beauclerk, her Life and Work, 1903, p.xii.